Doesn't mar the shaft and provides a much greater axial load than set screw collars. Used when the end of the shaft is accessible, and collars can be slid into position. Function as a clamp around the circumference of the shaft. Held in place by one socket head cap screw. 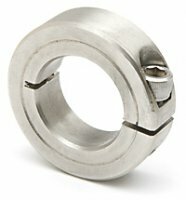 Diameters up to 1-1/2 inches (35mm) have a relief cut, which allows the smaller screws used in those diameters to provide maximum clamping load. Inch - steel, black oxide, bright finish stainless steel and aluminum. Metric – steel, black oxide and bright finish stainless steel. 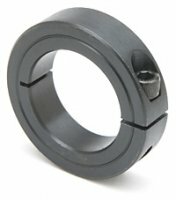 Make sure you see our full selection of shaft collars.